The best shoes for walking on concrete are ideal for both ladies and gents who spend a better part of their day walking, standing, or running on hard surfaces. 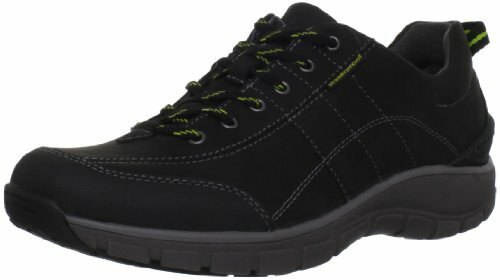 Whether you will be involved in heavy lifting or not, these type of shoes can offer the beet support and comfort despite the demanding nature of your job. Unlike ordinary shoes, they are designed to prevent hip, foot, muscle, and ligament pains and offer support to arch and ankles. Their cushioning and breathability are great to reduce the discomfort that comes with a hard day of stepping on concrete. No matter how young or healthy you are, make it a point to buy the best shoes for working on concrete to avoid severe fatigue, leg and muscle pain. You may be required to trade off style for extra comfort, but it’s usually worth it in the end. After all, you would prefer to be pain-free, rather than stylish but suffering. In this review, we present you with a seven best shoes for walking on concrete so that you make your pick. There is a wide range of walking and running shoes manufactured by New Balance Company. When the company was first established it was meant to produce shoes for athletes. However, due to the continued research and design, a wide variety of shoes serving all purposes now exists. 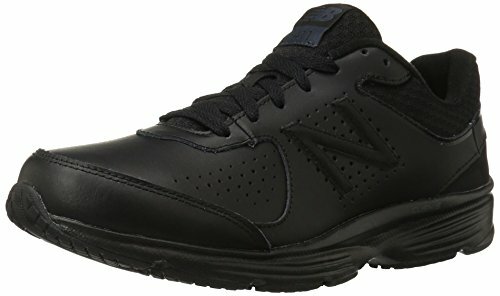 The New Balance Men's MW411v2 Walking Shoe is ideal for those who are looking for an affordable shoe and can withstand walking on hard concrete floors. The outer material is leather while the outsole is entirely made from rubber and absorbs shock. However, after prolonged use, its shock absorbing ability can fade, making it feel like an ordinary shoe. The insole is of better quality, although since it’s removable, you can swap it with a better one. The best part about this shoe is the perforations on its sides, which makes it extremely breathable even in hot environments. The lace-up design helps to secure the shoe so it does not slide off while working. In simple words, the New Balance MW411v2 has the following pros -- it’s economical, breathable, comfortable, and equally durable. There are a few shortcomings, though. First, its style is nothing to write home about. Secondly, as a medium-budget shoe, it’s also likely to conk out after a year of use. It offers very little arch support, too. All in all, this New Balance pair is a walking shoe thus not the right fit for those who do lots of standing. 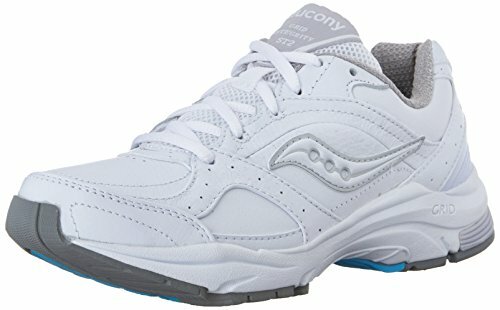 The Saucony Women's ProGrid Integrity ST2 is a smart looking walking shoe that offers impressive performance. The top sports full-grain leather, a roomier front end, and a lace-up design for a tight but comfortable fit. The tongue and collar are padded with plush material for optimum comfort as well. This Saucony pair comes with a cushioned insole for an ultra-soothing feeling. As you can see, the company has gone several miles further to ensure comfort is not lacking. This makes this shoe one of the few reliable footwear for individuals with pronation problems. On the outer side, ProGrid Integrity ST2 also has plenty of features to offer, from the PROGRID cushioning, non-slip sole to the durable XT-900 material that guarantees a long-lasting outsole. In a nutshell, this women’s shoe is durable, extremely comfortable, lightweight, affordable, and good for both indoor and outdoor activities. Of course, this Saucony shoe has a few setbacks as well. The insoles are thin, for example, and it lacks better breathability, a common issue with full-grain leather shoes. Nevertheless, going by the thousands of customer reviews this shoe has received online so far, it would be fair to say it does not disappoint. Clarks Women's Wave Trek Sneaker is an all-weather shoe designed to keep you comfortable while on your toes for as long as necessary. The compact, light, and delicate design make it appealing for any event. This shoe is made from genuine full-grain leather with waterproof capabilities. So if you walk or work in places with a lot of spills and splashes, this is the shoe to buy. It is comfortable with or without inserts. The interior is roomy all the way to the toe region to allow for toe movement. The sides are lined with the softest fabrics to minimize the bruising effect of wearing full-grain leather. Both the midsole and the outsole can provide extra comfort by absorbing shocks when you step on stones and other hard objects. The Rocker rubber outsole is resilient and will serve you for a very long time without requiring a replacement. The Ortholite foot bed this concrete shoe comes with is removable, too, so you can add in your own custom pieces. 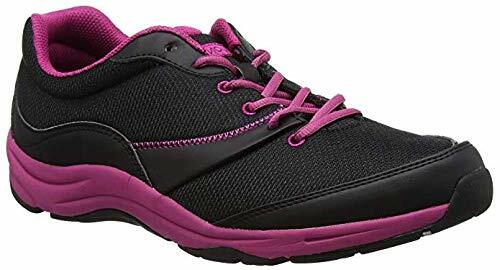 Overall, the Clarks Women's Wave Trek Sneaker is extra durable, extremely comfy, lightweight, stylish, completely waterproof, and suitable for all weather occasions. Some of the few setbacks to expect include the shoe getting hotter and stiff. Generally, it is a reliable shoe for working on concrete. Due to the WAVEwalk walking technology, the pain you feel in your legs at the end of the day will be minimal. Are you a casual everyday walker in need of better shoes? Try Brooks Men's Addiction Walker V-Strap Walking Shoes, and with time, you might get addicted to them. The outer covering is full-grain leather with enough strength to block anything from penetrating through. Time-conscious individuals will find the dual hoop-and-loop closure design to be quite a convenient addition. Since walking on concrete does take a toll on most people, this shoe comes with a padded tongue, collar and MoGo midsole cushioning for a relaxing experience. The breathable fabric lining, on the other hand, allows for air circulation to avoid overheating. Unless the other orthotics you have are super-efficient, it’s not advisable to switch the ones this shoe comes with. Because they are not only good-looking but come with arch support as well, a deep heel cut to keep your feet in position, and a thick, flexible design for maximum support and comfort. Like its insole, a lot can be said about the outsole of Brooks Addiction. Yes, it’s made from ordinary rubber, but some elements like maximum motion control and slip resistance give it an edge over other common outsoles. There are no severe shortcomings, either, except that the shoe is not waterproof and its high-end models are expensive. 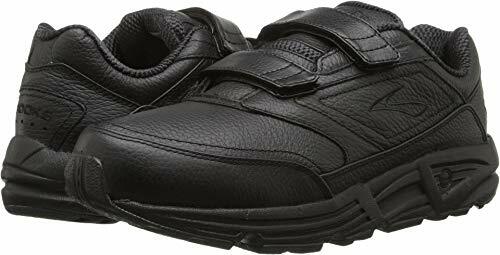 As the name suggests, Fila Men’s Memory Workshift Slip Resistant Work Shoe is a comfort-enhancing product thanks to the premium quality Fila Memory Foam Workshift and the plush synthetic overlays. If you are tired of putting up with foot pain while at work, this is the pair to look into. The rubber sole is durable, non-slip, and has aced various industrial standardization tests including ASTM F2913-11. While the shoe assures great traction, personal safety begins with you being careful. Fila Workshift doesn’t have the best style, but it perfectly blends comfort and performance, something that many stylish shoes lack. The lace-up closure style may be time-consuming to tie up compared to dual goring and hoop-and-loop V-straps, but at the end of the day, it secures the shoe on the leg, thus keeping you safe against corrosive spills. 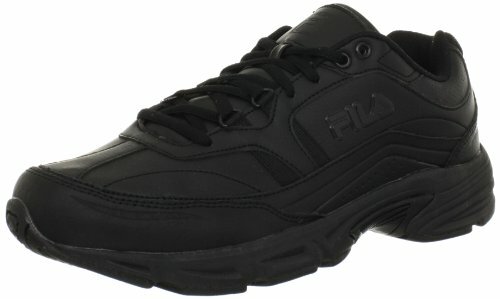 Some of the negatives to expect from Fila Men’s Memory Workshift Slip Resistant Work Shoe includes the substandard quality of the outsole, memory foam, and the synthetic overlays. Still, this shoe is affordable and can last longer when properly maintained. The colorful nature of Vionic Women’s Kona Fitness Shoes is probably the first thing you will fall in love with. As a medium budget shoe, most of its features are of premium quality. The sneaker is extremely comfortable, considering the top overlays are meshed synthetic while the rest of the parts are heavily padded. There is nothing special about the outsole apart from the fact that it’s made from rubber with mild cushioning. The removable EVA midsole, on the other hand, is firm yet flexible and offers better support than non-EVA varieties. It is removable, too, and can be swapped with something better in case you need an upgrade. Both the midsole and outsole have a longer lifespan. Unlike most shoes, Vionic Women’s Kona Fitness Shoes features a complex motion system technology that makes it hug the arches for a confident walk all day, every day. Thanks to a wide variety of colors available, this shoe might also be able to match with many of your clothes. The shoe is not waterproof, though, and cannot help with many foot issues such as plantar fasciitis and bunions. Otherwise, it’s comfortable, affordable, and lightweight, thus earning a spot as one of the best shoes for standing on concrete all day. The Brooks Women's Glycerin 15 is the latest lightweight edition from Brooks and is designed for walking and running on concrete. The shoe’s design is smashing, and there is a bunch of beautiful colors, making this pair look utterly feminine. 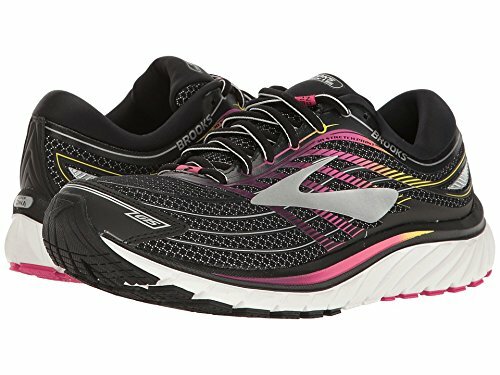 As the most comfortable product in this list, Glycerin 15 comes with a super soft cushioning system that comprises a plush midsole, collar, tongue, and the entire interior. You haven’t heard the best part yet. With most shoes, comfort zones are selective, and therefore a specific position (or movement) of the leg can introduce stiffness which results in an uncomfortable experience. Thanks to the plush transition zone and 3D Fit Print technology, Brooks Women’s Glycerin 15 expands with every move of your leg to allow for a soft and smooth transition. Above all, this shoe is flexible, lightweight, partially waterproof, and highly reliable for walking and running on concrete. The toe region can run a little wider, but that’s not a deal breaker. All in all, this would be the best shoes for walking and working on concrete the whole day. As the first layer of protection, the outsole should be thick and sturdy enough to safeguard your foot against the rough floor. Dense soles tend to last longer than others of lower quality. Premium-quality outsoles also have tough treads to keep you stable on wet surfaces, preventing the risks of injuries from slipping and falling. Additionally, since the sole forms the first layer of defense against sharp objects, it should be dense enough to stop possible penetration. Thicker soles also absorb shock when you step on huge stones. The best shoes for walking all day on concrete must have an element of safety in them. Construction workers, restaurant servers, and at times, bar attendants, work on slippery surfaces that could easily result in severe injuries if they fall. Therefore, a regular shoe must have a slip-resistant sole for better traction. Arch support is an essential element of any shoe as it contributes to comfort. If you have high arches, you are likely to suffer from under pronation, and if your arches are low, then you are likely to suffer from over pronation. Anyone without these issues can pick a concrete shoe of any arch shape. However, if you have arch problems, then you must purchase a shoe with proper arch support. The outsole may be of excellent quality, but it still needs the assistance of the inner sole to provide next-level comfort. Note, though, that custom insoles are usually of better quality than those that come with the shoe. Insoles made from the gel and other softer materials can provide a soothing cradle to your foot and allow you to stand throughout the day without feeling pain. You can also take a look at the well-cushioned removable insoles for a better experience. For someone who walks, stands, or is always running on concrete floors, the interior of the shoe is bound to get hotter. Therefore, the shoes you buy must have some perforations or a mesh system that allows for air circulation. The footwear must keep you stable on your feet at all times when walking. This type of surface can become very slippery if you find yourself having to brave any liquid spill on the floor. Non-slip or slip-resistant shoes are a must for those working in environments that have hard floors and are prone to spillages of any kind. Always check if the weight of the shoe bothers you or not. Lightweight shoes are the best so as, you will free yourself from adding another kilo to your overall weight. Additionally, if the shoes are too heavy, your feet might suffer too, which defeat its purpose. The style of shoe you choose can also make a difference. Boots offer the best support and stability but they are often very hot to wear, and your feet could tire after a while when wearing boots on this kind of hard surface. Clogs and slip-on are very practical and comfortable to wear, and they are both designed with comfort in mind. Both are intended to work as footwear will usually have non-slip outsoles, and a clog is one of the most comfortable shoes to wear when you spend the majority of your day on your feet. Lace-up athletic styled shoes will also offer the kind of support, traction, and durability you need when looking at the best shoe for the job. To help you get ahead of things with your concrete shoes, here are a few frequently asked questions that other customers frequently seek answers to. Q 1: Are irreplaceable insoles the best? A: Yes and no. Irreplaceable soles can be a valuable addition if they are both comfortable and long-lasting. Otherwise, something of a poor quality that doesn’t offer a chance for replacement with a better custom version is a bad deal. Q 2: Is arch support mandatory? A: Unless you won’t be standing the whole day, it pays to grab shoes with the best arch support to avoid muscle and ligament pain. It’s also comfortable when the shoes hug your arch perfectly. Q 3: What do symbols D, E, and W mean in the shoe world? A: Various brands use these symbols next to a shoe’s size to indicate their width. W is usually a standard width for many people. If you don’t know your exact width, make it a point to read the manufacturer’s sizing chart for some explanation. Q 4: Can these shoes do other outdoor activities? A: These shoes' main job is to give you comfort and keep you safe when walking on the concrete. However, it wouldn't hurt to see if these shoes can also do other things. For example, my walking shoes are best for the city trips, while, it can even survive mild hiking in tropical countries, and can take me on a short and quick run. Q 5: How to know if this is the best walking shoes for me? A: The thing is, it won't be an easy task. But if you have asked the questions above, checked everything on your list, it will be time to visit a shop and try it on. If you are ordering online, make sure to get one that you can return in case it doesn't meet your expectations. Walking and standing on hard surfaces for hours can be uncomfortable and painful. If you keep ignoring foot pain, you could end up with various foot conditions like bunions, plantar fasciitis, over pronation, and under pronation. However, with the best shoes for walking on concrete, you can commit to your daily activities and get back home with a happy face. There are thousands of shoes on the market designed for walking on concrete. By looking at features such as a top-quality midsole, memory foam insole, mesh system, flexible sole, and other things, you can easily single out the most reliable shoe for walking, running or standing on concrete floors. If you don’t know where to look or how to get started, consider some of the options reviewed here. Ultimately, the choice is yours and will be based on your own preferences. Just be sure when deciding which shoe you want that you get all the features you need to keep your feet comfortable throughout the long day walking on a hard floor.